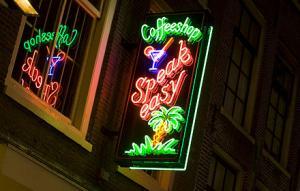 A ruling by the European Court of Justice paves the way for the Netherlands to ban foreigners from buying weed in the country's famous coffee shops. Is Amsterdam about to become Amsterdone? Saying the effort to combat drug use and drug tourism outweighed European Union provisions for equal treatment for all EU citizens, the European Court of Justice last Thursday upheld a Dutch border town's ban on the sale of marijuana to foreigners. The ruling paves the way for Holland to institute a national "weed pass" to keep non-Dutch out of the nation's famous coffee shops. The ruling came in Josemans v. Maastricht , in which Maastricht coffee shop owner Marc Michel Josemans challenged a 2005 Maastricht ban on selling cannabis products to non-residents. He was forced to temporarily close his shop after selling to foreigners in order to set up a test case. Josemans challenged the law in Dutch administrative courts, which asked the European Court of Justice to review the issue. "The prohibition on the admission of non-resident to Netherlands 'coffee shops' complies with European Union law," the court held. "That restriction is justified by the objective of combating drug tourism and the accompanying public nuisance, an objective which concerns both the maintenance of public order and the protection of the health of citizens at the level of the Member States at European level." Josemans had argued that barring foreigners from the coffee shops amounted to illegal discrimination under EU law, but the court held that because their product was illegal, coffee shop owners could not rely on EU protections: "As the release of narcotic drugs into the economic and commercial channels of the European Union is prohibited, a coffee-shop proprietor cannot rely on the freedoms of movement or the principle of non-discrimination in so far as concerns the marketing of cannabis," the court held. The ruling opens the way for Holland's conservative Liberal/Christian Democrat governing coalition to institute a nationwide ban on foreigners purchasing marijuana at the coffee shops. The government is planning to introduce a "weed pass" that will be required to purchase pot and will only be available to Dutch citizens and legal residents. "If the Council of State rules that access to coffee shops can be limited to inhabitants of the Netherlands, then the weed pass this Cabinet wants to introduce can be limited to inhabitants of the Netherlands and that helps combat drug tourism," Justice Ministry spokesman Wim van der Weegen told Bloomberg News  Friday. Barring foreigners may be a Pyrrhic victory for Dutch border towns. Maastricht alone sees 10,000 visitors a day, mostly from Belgium, Germany, and France. The number of those visitors who come primarily to purchase marijuana is substantial, and, of course, pot isn't all they purchase. Income and tax revenues from border city coffee shops are likely to decline precipitously. The looming ban on foreigners in coffee shops is just part of a larger crackdown on the shops in Holland. Their numbers have shrunk by about half from their peak as local governments seek to close shops that have violated the law, are too close to schools, or otherwise inconvenient for local authorities. The national government is also hostile.